It was around a month ago now that my first Christmas email of the year arrived in my inbox. It was like receiving that very first Christmas card at school - a simple form of communication, but somehow managing to announce the start of the most wonderful time of the year. But, just like your 14th Christmas card (gone are those days! ), it takes a lot for your 400th Christmas email to really make a big impression on you - the sad fact is, after a while they all start to look the same. Luckily, there will always be the odd Christmas card - and Christmas email - that reignites that first, nostalgic Christmassy feeling in you. Whether it’s because of its amazing design or beautifully written message, some things just have the magic touch. For me, these eight brands have just that - all for very different reasons. From the legendary Christmas carol 12 Days of Christmas to a Lindt chocolate advent calendar, people love a good countdown at Christmas - including the cool cats at Burberry. 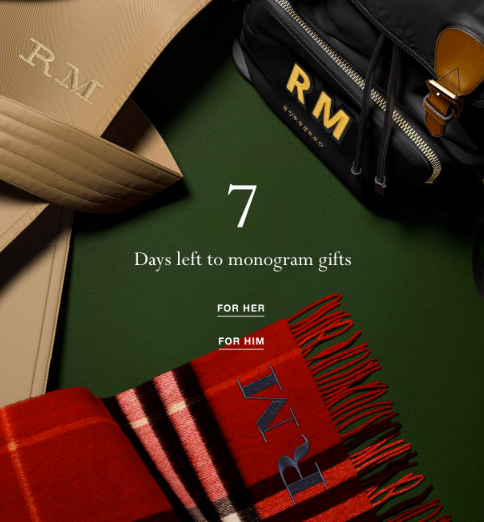 In an email reminding subscribers how many days left they have to ‘monogram gifts’, the iconic brand simultaneously showcases epic personalisation skills (notice the RM initials on the email below - sent to fellow Ometrian Rita Martins), but also its incredible dynamic content capabilities. As you’ve probably guessed, the number shown in the content of the email changes according to how many days are remaining when a recipient actually opens the email. In terms of overall design, this email is a classic case of less is more. When you have the right tech installed, as well as a good quality image and clear, up-to-date message, there’s no need for tedious rambling and endless hyperlinks. For the Christmas gift shopper, trusting that an item ordered online is going to arrive in time for Christmas Day plays a big part in the buying decision process. Whilst one ecommerce brand may have the perfect gift in stock, if it cannot guarantee speedy and efficient delivery a customer is likely to go elsewhere - even if it means purchasing a less desirable gift. The anxiety surrounding gifts arriving on time is something Ralph Lauren has clocked, and capitalised on in the festive email below. The American label grabs a subscriber’s attention with this cleverly worded subject line, promising to deliver ‘timeless’ gifts ‘on time’. In a world of hilarious memes and social media posts so good they go viral, it’s increasingly difficult for marketers to really make their mark when it comes to copy. As we witnessed over the Halloween weekend, whilst many subject-lines and email headers were hair-raisingly good, they are not necessarily not unique. Which brings us to Mulberry. On the back of its truly unique Christmas ad this year, the British brand has also upped its game with email marketing copy. Despite its simplicity, there’s something inexplicably powerful about the headline: ‘Top of her list’ - positioned at the top of the email, next to an image of a handbag sitting atop a Christmas present box. 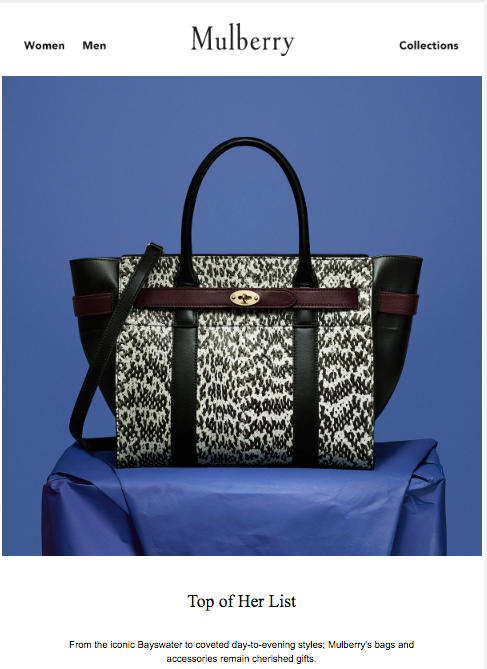 Looking more closely at the exact wording of the email, ‘Top of her list’ is stated as a fact, therefore reassuring a gift buyer that purchasing a Mulberry handbag is at the least a safe choice. This is backed up by the caption beneath it, confirming that, from the ‘iconic’ Bayswater to ‘coveted day-to-evening styles’, Mulberry products will always remain ‘cherished gifts’. As important as copy is, sometimes all you need is a beautiful, captivating image, gif or typography to make a Christmas campaign successful. Just take a look at this snippet of an email from French fashion retailer The Kooples. The truth is, there’s nothing technologically groundbreaking about this email - there is no impressive personalisation or dynamic content. The reason it works is because it looks good. 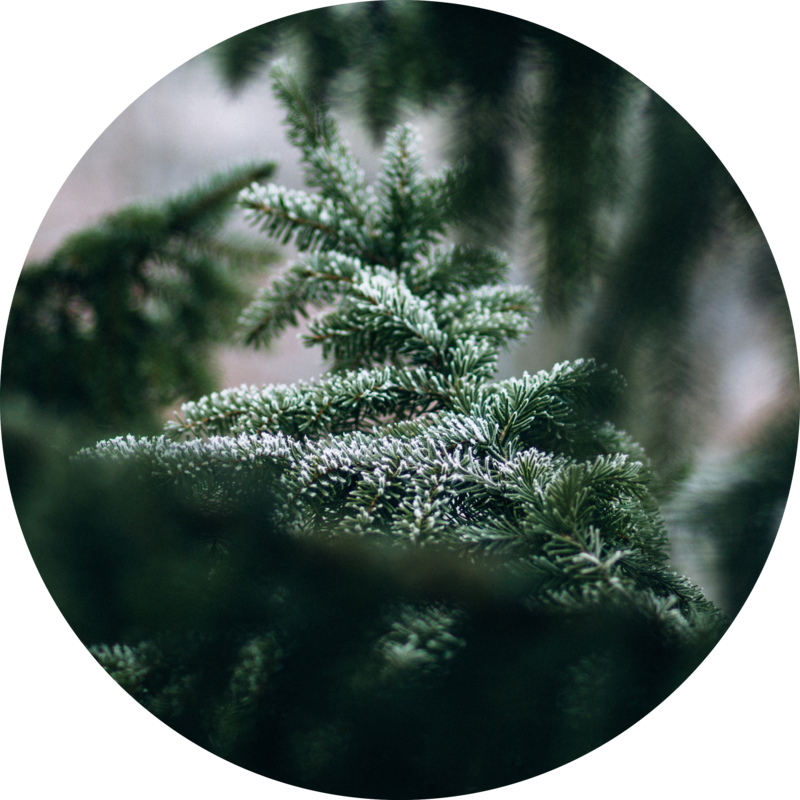 The brand has cleverly thought about what everyone loves about this time of the year - the wintery colours, the sparkly decorations - and found a pretty gif reflecting this. This just goes to show how far a good quality image or beautiful gif can go when it comes to email marketing. Of all the retailers out there, why should a gift shopper invest in your brand this Christmas? Because of your brand story. if you’re a small, independent business, this is something that’s definitely worth focusing on for your email campaigns. For example, we love this festive email from the personalised, hand-engraved jewellery manufacturer Merci Maman because it offers a sneak peek into how a gift is made. Through its good quality, warm and inviting image and carefully worded gif, Merci Maman communicates that it can not only bring your ‘gift to life’ by hand making your orders, but also your ‘words to life’ by engraving your personal message onto each item. With the subject line ‘A Dog’s Not Just For Christmas’, we found it impossible not to open être cécile’s Christmassy email - which turned out to be promoting a free dog-themed calendar on all orders over £150. Why does it work? The subject line, which initially seems a bit risky (this is a message usually reserved by animal welfare charities during this time of year and not to be belittled), makes sense upon learning that it’s a calendar being offered - therefore something to stay with you throughout the year. Everyone knows that calendars make great Christmas presents, so this freebie might not only appeal to a dog-lover shopping for themselves, but also a gift buyer looking for extra stocking fillers. It’s funny and lighthearted, and does eventually remind recipients that a dog is indeed not just for Christmas, but a new, loving addition to your daily life - every day of the year. Of all the emails we’ve loved so far this Christmas, CRU Kafe was the only one that really delivered when it came to content. From mulled wine to mince-pies, this is a time of year when people love to stay indoors and try out new recipes for friends, family and colleagues. 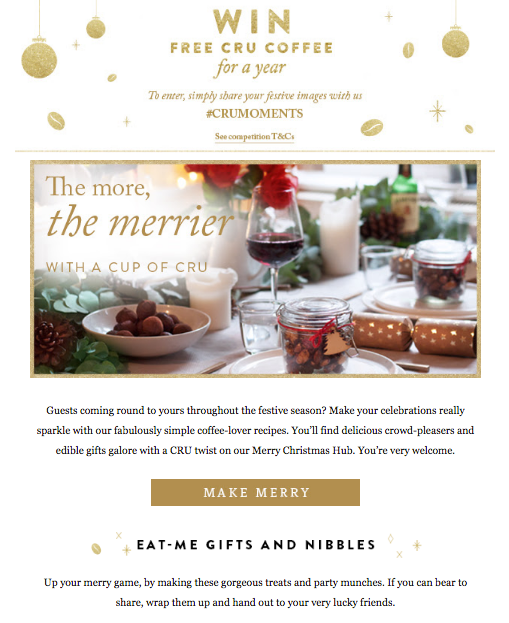 As well as a promoting a fun photo-sharing campaign, this wonderfully designed email goes to town with coffee-inspired suggestions, demonstrating a true passion for food and drink (whilst also promoting CRU products!). As we all know, as well as being (potentially the most) powerful marketing tool for retailers, email can also be used to join the dots between different channels - including on-site. Just as we were about to publish this blog post, I received the following email from Dior, inviting me to try out its online Christmas gift finder. Once a recipient has clicked on 'start' now, they are swiftly redirected to the Dior gift finder landing page, where they are greeted with more simple steps. Thanks to the email's well-formatted template, straightforward copy and inviting imagery, the journey from opening the email to finding a gift is totally seamless. You can’t always predict when a Christmas email campaign is going to really take off; sometimes a genius ideas can fall flat on its face, whilst other times a seemingly mediocre campaign can go viral. There are, however, things you can do to make sure your brand’s marketing does always glisten with a hint of the aforementioned ‘magic touch’ this time of year. After analysing the eight emails above, here’s a summary of things to try next year. A different approach to your subject-line: different subject lines work at different times of the year. Whilst snippets from Christmas carols and festive puns will definitely go a long way during early December - when you want to create that aforementioned Christmas buzz - you might find recipients are more interested in learning about delivery time frames or return policies as the last-minute rush sets in and reality hits. Experiment with dynamic content: When it comes to Christmas, everyone loves a good countdown leading up to the 25th! Think about how your brand can make the most of today’s technology to create content that changes depending on when a recipient opens your email. Copy? Try something different: Sometimes, less is more. Use your words carefully, avoid cliches and listen out to people’s conversation around you to create a fresh Christmas slogan for your brand. Beautiful images will never get old: From automation to 1:1 personalisation, retail marketing has transformed over the past century, but one thing that will never go out of fashion is engaging, evocative and aesthetically pleasing imagery. This is something to bear in mind if you do find yourself working to a tight deadline with limited resources. Remember your USP: Why should the person opening your email buy from your brand this Christmas? Some of the recipients won’t even remember who you are. Always remember to communicate a bit of brand personality in your marketing emails - no matter what the campaign. Think outside the box: Who’d of thought a free dog-inspired calendar would make a great Christmas campaign? Embrace even your most weird and wonderful ideas to ensure a genius idea isn’t accidentally laughed out of the room. Give something extra to your recipients: From recipes, to DIY Christmas decoration ideas, to interactive gift-guides to well-written blog posts, there are endless ways to spoil your subscriber lift around this time of year without spending a penny.